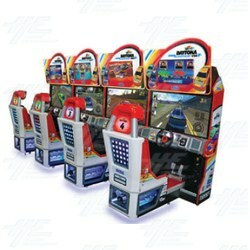 Daytona USA is the holy grail of arcade racing. Daytona 3 comes 18 years after Daytona USA 2: Battle on the Edge was released (in 1998) and 22 years after Daytona USA was first launched in 1994. This brand new entry brings Sega’s #1 racer screeching into the 21st century. Daytona Championship USA features three brand new tracks including a recreation of the newly renovated Daytona International Speedway. In addition, the original three classic courses have been remastered for the modern era. Sega has gone all out to stand out from the pack. Lit from top to bottom Daytona even has a moulded under seat engine. New game features include a live camera feed so you can enjoy maximum bragging rights as you overtake your friends. Also, brand new to Daytona is the ‘Live TV’ inspired video billboard. This brand new feature allows spectators to see what’s happening in the race, whether it’s a crash, a pass for position or to find out who’s winning or losing.